The premise of Living Lightly is that, when you “lighten up” and let go of worrying and obsessing and simply focus on being happy and healthy, weight loss follows. Once a client or student tells me that they are feeling “lighter” and “less weighed down by life,” I know they are on the road to shedding pounds. I have actually seen clients lose up to 12 pounds in one week. However, an average of 2 pounds per week is the norm. Living Lightly is not a fad or a craze. It is built on solid principals of eating real food, exercising safely and having FUN while you’re doing it! If this program has helped you in the past, please share it with someone who might like it as well. 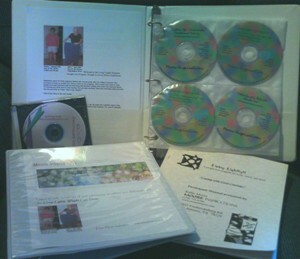 If you are hearing about Living Lightly for the first time and want to know more, feel free to contact me. If you do not live in the San Antonio area, you can still take advantage of Living Lightly for Home Use. Beginning Tuesday at 6 p.m. on October 18th, I will be offering the Living Lightly Weight Loss Series. Class size at the Citadel Plaza location is limited to 6 individuals. You may register online by visiting this website link. Sign up for one class for $35 or sign up for all six and save $30. CDs can be purchased separately for $20 each or buy two and get the third free. Each class includes lecture/discussion on the topic of the day and a 45-minute hypnosis session. Classes are first-come first-served, so pay in advance to ensure your spot in class. The agenda is as follows: Class #1: Tuesday October 18th: “Lighten Up”– Simple behavior changes to increase your likelihood for success, including letting go of emotional eating. Reduce portion size, drink more water and make healthier food choices. Class #2: Tuesday October 25th, 6 PM “Exercise Motivation”– Find and stick with your own ideal exercise plan. Desire to exercise is increased with hypnosis. I teach you to “future pace”, which is to imagine what your body will be like one month, six months, a year into the future after exercising consistently. Class #3: Tuesday November 1, 6 PM “Eliminating Cravings”– I will be discussing the reasons for cravings, with emphasis on the roles that sugar addiction, carbohydrate sensitivity and Candida play. You are then lead on a hypnotic journey to identify your own bad foods to eliminate or good foods to increase. Hypnosis helps you let go of the bad foods and embrace the good ones. Class #4: Tuesday November 8th, 6 PM “Detoxifying the Body”– I will teach you some methods for detoxifying the body of unhealthy substances, like old undigested foods, that actually keep you from losing weight. Detox is a great way to restimulate weight loss if you hit a plateau. Methods for detoxing every organ system will be discussed. My favorite class! Class #5: Tuesday November 15th, 6 PM “BE a S.T.A.R.”– Use the power of visualization to achieve and maintain your ideal weight. We examine the role that ‘negative body image has on deterring weight loss efforts. Write your own affirmations and create your own image board to counteract the negative programming that may go all the way back to childhood. Class #6: Tuesday November 22nd, 6 PM “Wrap Up Problem Solving.”– Still having problems in some areas of your weight loss program? This is the class for resolving any leftover issues. I will discuss each student’s issues individually and provide suggestions and hypnotic techniques for coping with each. If you have a group of five or six and would like to set up a different time or different number of classes, please contact me to discuss options. I am also available to teach Living Lightly Offsite and would love to do so as part of a wellness program.